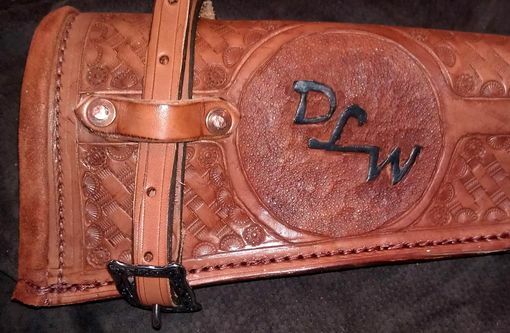 This is a custom designed and manufactured scabbard for a customer in VA. who hunts and does Cowboy Mounted Shooting. The scabbard is made from 12 oz Wicket and Craig skirting leather with a deep russet 4-5 oz suede liner. Sandwiched between the leather and sued is a rawhide inner liner that holds the shape of the case open enough to pull the rifle easily from the scabbard but tight enough to keep it in over rough terrain. Three initials round out the piece.